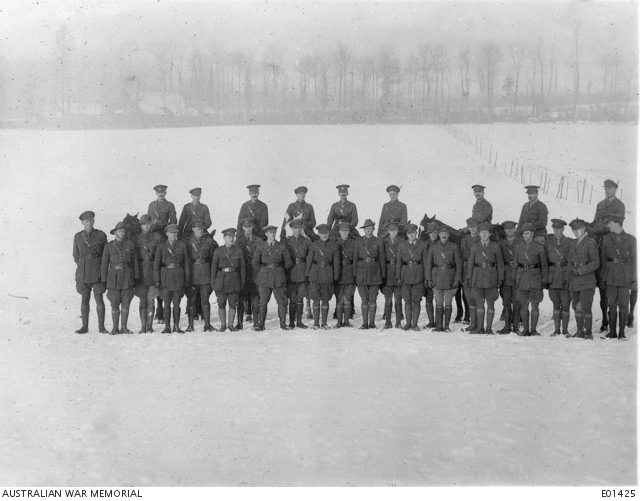 Outdoor group portrait of the officers of the 58th Battalion in the snow at Courset, France. Identified from left to right, back row on horseback: Captain (Capt) John Stewart Tait from North Fitzroy, Victoria; Capt Harold Dunstan George Ferres from Toora, Victoria (later Lieutenant Colonel and awarded MC and Bar and DSO); Capt Bertram Van Someren from Mosman, NSW, Regimental Medical Officer (RMO); Capt Thomas Arthur Fairfax MC from Murtoa, Victoria; Lieutenant Colonel (Lt Col) Charles Aloysius Denehy DSO (later awarded Bar to DSO and Belgian Croix de Guerre); Major (Maj) Neil Mackenzie Freeman DSO from Geelong, Victoria (later Lt Col); Capt Robert Bruce Gilchrist from Auburn, Victoria; Capt Francis Daniel Johnstone from North Fitzroy; and Lieutenant (Lt) James William Collins from Mosman, NSW. Front row: Lt Herbert Ernest Baensch from Dimboola, Victoria (later killed in action in France on 22 June 1918); Lt Eric Alan O’Malley MC from Quorn, South Australia; Lt Ivo Garfield Thompson from Petersburg, South Australia (later awarded MID and killed in action in France on 4 July 1918); Lt Normal Livingstone MacKinlay from Geelong; Lt Frederick Brayshaw McWhannell from Christchurch, New Zealand (later awarded MC); Lt Harold Victor Morey from Yarra Junction, Victoria (later killed in action in France on 2 September 1918); Lt Alexander Robertson from Melbourne; Lt Hugh Julian Boyd MC from Bendigo, Victoria; Lt Gordon Eliott MacKenzie from Hamilton, Victoria; Lt James Syder from Ascot Vale, Victoria; Lt Thomas Elis Tait from Malvern, Victoria (later Capt); Capt Forbes Campbell Dawson MC from St Kilda, Victoria (later awarded DSO); Lt Gordon Laing from Balmain, NSW (later awarded MC); Lt Sydney Ambrose Webb from Moonee Ponds, Victoria; Lt Horace Beverley Stanley from Ashfield, NSW; Lt Charles Russell Cole from Camberwell, Victoria; Lt Cornelius Aloysius Deane from East Melbourne (later awarded MC); Lt Richard Herbert Trengove from Ballarat, Victoria; Lt Frank Joseph Weir from Melbourne (later killed in action in France on 29 September 1918); Lt Charles William Scott from Ascot Vale, Victoria; Lt Lewis Francis Reynolds from North Melbourne; Lt William Flintoft from South Yarra, Victoria; and Lt Norman Dalgleish from Flemington, Victoria (later awarded DSO and died of wounds in France on 9 October 1918).